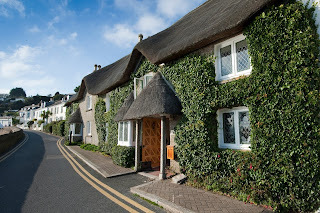 With diamond paned windows, thatched roof and covered in ivy, Seacliffe Warren could be mistaken for a country escape. 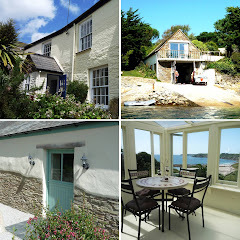 Instead, the beautiful old cottage, thought to be the most photographed property in St Mawes, is positioned right on the waterfront of the exclusive fishing village in Cornwall and is the latest property to join Cornwalls Cottages’ growing portfolio of luxury holiday homes. Located directly above Tavern Beach with stunning uninterrupted views over St Mawes Bay towards the Lizard Peninsula, Seacliffe Warren provides flexible and spacious accommodation for up to nine guests. Perfect for families or groups of friends, key features of this unusual and recently refurbished property include an open plan living space complete with beamed ceilings and divided by a central feature staircase, one side offering a cosy seating area with log burning stove and the other a dining and TV viewing area. There is also a separate TV room with sofa bed and a ground floor wet room with under floor heating specifically adapted for guests with disabilities but also makes an ideal area for those returning from the beach, sailing or walking. The kitchen is fully fitted and has an Aga and there is a separate utility room. For those wanting to bring as little kit for the children as possible, a cot and highchair are available in the property. Upstairs, there are two double bedrooms, one twin and one single bedroom, three of which are at the front of the property allowing guests to enjoy the views when lying in bed, a second shower room, a family bathroom and separate toilet. At the rear of the property is a large garden, suitable for guests who want to bring no more than two well-behaved dogs, complete with barbecue area and garden furniture to take in the sea views. There is parking for two cars in and in front of a garage 100 yards from the property. Seacliffe Warren is available to rent from £699 out of season to £1999 in peak season. Short breaks are available on selected dates from February to March and October to December. A 20% discount is available for couples booking outside the peak season using one room only. At the rear of the property is a immense garden, suitable for guests who need to bring no over well-behaved canines, complete with barbecue area. As we all know that to spent our vacation and to get rid of our hectic office work scheduale we require a good home accommodation such as holiday homes rarotonga where we can feel relax and can spent our vacation joyfully.